Reyes will undergo surgery Thursday to repair a torn meniscus in his right knee, Dennis Lin of The Athletic reports. Reyes picked up the injury earlier in the month while playing in the Dominican Winter League, and surgery was ultimately deemed necessary after further evaluation. 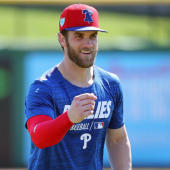 The procedure typically carries a four-to-eight week recovery timetable, so the expectation is that Reyes will be ready to go for spring training. Prior to suffering the injury, Reyes hit .444/.510/.689 with three homers and six RBI in 13 games for Escogido.